Back to another quick stop on the Scratch the Surface Tour 2017, this time in Moyie, British Columbia. There are some buildings which have always fascinated me for as long as I can remember. Back in the early 1980s, my family would often make a weekend trip out to Creston to pick apples. 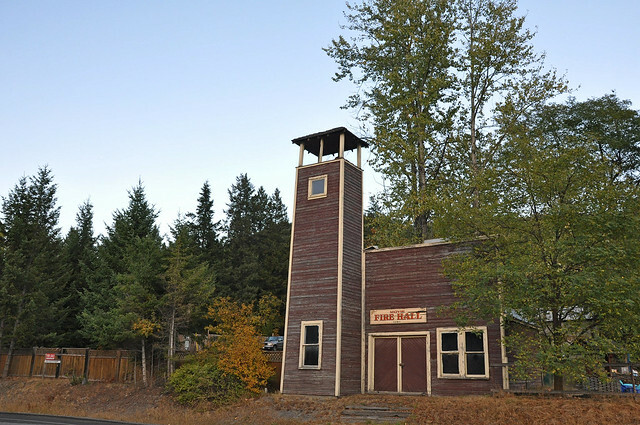 As soon as we would be getting close to Moyie, you would find me in the backseat with my face pressed against the window waiting to catch a glimpse of the small wooden fire hall which stands right next to the road. It wasn’t until I was on a solo road trip in August of 2013 that I actually had the opportunity to stop and get a closer look at the building up close. It was like being a kid again, complete with my face pressed up against the glass — except this time the glass was the dirty panes of the 1907 building and not a 1975 Ford LTD. It was hard to see inside but it certainly whet my appetite for a chance to get inside, a desire which remains unfilled. 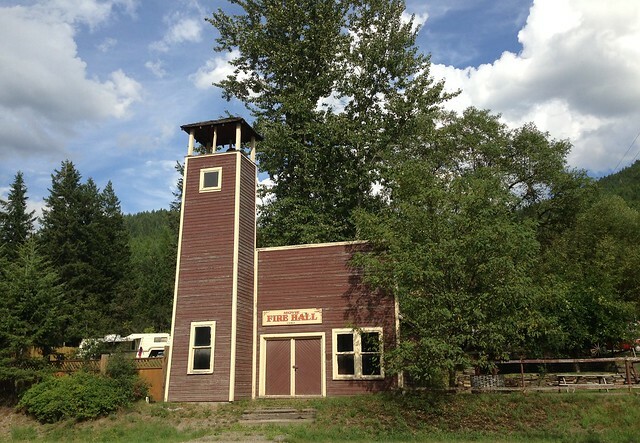 Now that I have graduated from the backseat to the role of driver, I have vowed to never drive by the Moyie Fire Hall without at least pulling over to grab a photo or two. Like all historic buildings, one never knows when you might not get a chance to ever see it again. As with most of the objects of my interest, my research has been pretty limited and mainly consists of what I can find online. I have been able to piece together a little background of the building. As indicated by the sign hanging over the main doors, the hall was built in 1907. The hose/bell tower was added a couple of years later. Photos from the 1950s show the fire hall was already abandoned by that point and it appears it had been that way for quite some time. The author speculated that it fell into disuse by the 1930s, which is a logical leap given how the town declined rapidly once the nearby St. Eugene Mine closed for good in the late 1920s. In the above photo, dated to around 1950, you can clearly see the building has fallen into a state of disrepair. Three of the window panes have been boarded up, the main doors are ajar, and the building appears to need a coat of paint. It’s quite interesting to see the sleepy dirt road running in front of the fire hall, a far cry from the busy highway which now occupies that space. Another photo, this time claiming to be circa 1965, shows little has changed in terms of the condition of the building. Most of the glass has been broken in the windows, the doors remain ajar, and the building is still requiring paint. Notable in this angle is the wooden ladder which can be seen mounted on the side of the bell tower. It extends only partway to the ground and I am not sure if this was the original design or if the lower section had been removed at some point to deter the local youth from climbing up to the upper reaches of the tower. It is not unfathomable that the firefighters would have had to use a ground ladder to access the ladder on the side. Or, perhaps, they climbed onto the roof and then stepped out onto the tower ladder. Unless other photos exist which show this same angle, we’ll likely never know. What is known, however, is that by 1988 (the circa date on the above photo), the ladder on the side of the tower has been completely removed. The building has been given some TLC (it’s a bit of a stretch to call it a restoration) and has a new lease on life. It has been given a fresh coat of paint, the windows have been boarded up or replaced, and the fire hall sign has been hung over the doors. The date on this restorative effort is confirmed by Chris Doering of BIGDoer.com who was living in the area and remembers it being done in the 1980s. Our visit during STST2017 was brief. Just enough time to run across the highway and snap a couple of photos and, once again, press my face against the glass and peer inside. Somewhere between 1988 and 2013 the wood was removed from a couple of the windows allowing for more visual access, including into the base of the tower. I would love to have obtained some drone footage, especially of the top part of the bell tower, but the building’s proximity to the busy highway makes doing so legally impossible. We were also short on time so this had to be a quick whistle-stop on our tour. Maybe one day I’ll get to live that childhood dream of setting foot inside this classic fire station. This entry was posted in History, Travel and tagged abandoned, British Columbia, Canada, fire hall, Moyie, Vacation 2017. Bookmark the permalink. Went inside it in the 1980s, I don’t recall much however. I was into this kind stuff back then, but in a far more casual way. Thanks for the shout out!